As CicLAvia came to a close and streets were being re-opened to cars, well-meaning police officers did their best to warn folks on bikes that their two-wheeled utopia was subsisting on borrowed time. And, while I was flattered that they thought I was young, I was rather flummoxed at the notion that they would have directed me to move from an empty eastbound lane of Wilshire to the right side of the dozen or so cars queuing up to turn right onto Hoover. Who told them it was a good idea to run cyclists in front of cars turning right? I wondered. This moment — the instant that the streets re-open to motorized traffic — is both the most informative part of CicLAvia and the most depressing. At Hoover, the officers’ admonitions directing bikes heading east along Wilshire to stay to the far right were entirely counterproductive (and dangerous). Those that took those directions as gospel headed straight for the gutter, hugging the curb as closely as possible. But, because there was no room to ride in the car-occupied lane, many soon moved up onto the narrow sidewalk, where they had to walk their bikes. All those now-pedestrians crossed through the intersection on foot, creating a tremendous bottleneck along Wilshire. Meanwhile, police continued to direct people to ride to the right of the growing line of cars waiting to turn right, despite the fact that the eastbound lanes remained almost entirely car-free. Along other sections of Wilshire that had been re-opened to cars, some people chose to ride on the sidewalks, wanting no part of car traffic. Others continued to brave it out in the gutters, slowly battling and weaving their way up hills, sometimes completely oblivious to — or utterly panicked by — the line of cars forming behind them. Still others, apparently lost in the bike-fest bubble, merrily blew through red lights with their children in tow. Not necessarily because all these inexperienced people were out on the streets — although that can be problematic, too — but because they were there and they were not protected by better infrastructure. Earlier in the day, I had been talking with cycling advocate friends about the next steps forward from CicLAvia. I loved seeing so many people out on their bikes, I had said, but what I really cared about was seeing cycling transition from a special-occasion or recreational activity to a more normalized one. As much as CicLAvia celebrates open and livable streets, it does so in a very protected and happy environment where police officers, traffic officers, and other volunteers are all on board to help ensure that everybody can move about freely and safely. Within minutes of the event coming to a close, however, everything goes back to “normal” — that reality in which streets are not particularly welcoming to novices on two wheels. Beyond the bus-only/bikes “OK” lanes, there is no real bike infrastructure or signage along Wilshire to direct them (despite police officers repeatedly announcing, “Stay in the bike lane! It will keep you safe!”), and the multiple (well-intended) admonishments by police via megaphone only served to make the act of riding on the street sound somewhat criminal. Were I new to the area, an inexperienced rider, or riding with children, I might have thought my best option was to get the hell out of the road and put my bike away until the next CicLAvia. The stark contrast between the happy and safe environment created by separating bikes and cars and the you-will-probably-die-if-you-don’t-stay-right environment that re-emerged as the barriers to intersections were removed are the reasons that current efforts to stripe more lanes are both so important and not nearly enough. It seems like every time I ride through the city’s first and only protected lane in the 2nd St. tunnel, I see one or two pylons from the protected bike lane that have been knocked down in some car crash. It’s a rather shocking thing to observe, especially when you realize that the cars in the tunnel have one job and one job only — to go forward. They can’t turn and they can’t switch lanes. If drivers are crashing, it’s because they’re distracted, drunk, impatient, and/or utterly incompetent. If it’s that bad where it should be the simplest to drive in a straight line, the multiple distractions and obstacles presented by a regular, open street mean that those on two wheels are even more vulnerable. And, yet, as noted here, the draft Mobility Element (currently open for public comment) has scaled back the miles of bike lanes that will be striped over the next several years. Meanwhile, cycling advocates have had to spend an inordinate number of hours making a case for the MyFig! project before neighborhood councils to counter the doubts (and, in some cases, outright opposition) expressed by major stakeholders like USC, the California Science Center, the film industry, and auto dealerships about the value of a protected bike lane along Figueroa between downtown and Exposition Park. It doesn’t make a whole lot of sense to me. If we want people to take cycling seriously as a transportation option — one of the core goals of CicLAvia — then cyclists need to have options that indicate the city takes their safety seriously. Without them, it isn’t clear novices will feel comfortable taking to the streets on two wheels. And those that do, including those that are more accustomed to riding recreationally, can be quickly turned off after a bad experience. It was a broken mayoral elbow that helped make the first CicLAvia possible. I would hate to think that injured mayors (or regular people, for that matter) are the only things that can push us to the next level with regard to facilitating active transportation. We’re already losing far too many people to hit-and-runs. If you’d like to voice your opinion on the Mobility Element and the need for bike infrastructure, please check their website here. If you’d like to learn more about bike lanes slated for implementation, please register for the April 17th webinar (7 – 8 p.m.) here or visit thelabikeplan.org. If you have other thoughts about what might help bridge the gap between the numbers of cyclists at CicLAvia and those that are willing to use bikes for transportation (i.e. better training of police officers, more education for cyclists, or more programs like Bike Trains) please post them below. What I’ve always noticed at the end of CicLAvia is that the cyclists don’t magically disappear once the streets are opened up, which is great because it demonstrates that this isn’t really such a strange and temporary phenomenon, all these bikes in the street. But you make an excellent point about “how well equipped” everyone is at this juncture. Perhaps a campaign during CicLAvia that actively educates people about how to navigate the roads post-CicLAvia would be valuable – even a basic bike skills workshop that ran on the half-hour, or a commuters’ hub somewhere that provided info to help facilitate biking on the regular. Perhaps a street team that goes around having conversations with the officers stationed around the route could amend some of their misconceptions. CicLAvia is a really cool, fun way for people to experience the city, but ultimately it becomes a sort of vacation from reality – and in that way it can be misleading. “I’d love to bike around town but it’s too dangerous” is the common lament. So the hostility is waning, and that’s great, but conversion requires more and your post illuminates why. I was also very curious about what the transition “back to normal” would look like, and so I hung around in front of the Wilshire Boulevard Temple (beautifully restored by the way, and my mom grew up going there!) from about 3:30 to 4:30 p.m. The first thing to note is that the police came through there not at 4 p.m., but at about 3:45 p.m., attempting to clear people from the street. On that stretch of Wilshire, however, they basically failed to stop CicLAvia. People moved over to let them pass, but then took back the whole street after they continued further down. The streetlights stayed as blinking reds in all directions for at least another 15-20 minutes, so the cross traffic was still pretty restricted in getting across Wilshire. It made me think maybe there should be a planned “long tail” to CicLAvia’s. Instead of such an abrupt transition, maybe there should be an attempt to promote an environment where there is a mix between car traffic and non-motorized modes, maybe as a means of promoting the idea that, as you say, CicLAvia should be a means of promoting a better situation for the other 362 days of the year. They could, for example, pull up all of the barricades but leave the blinking red lights on for the next few hours, which would prevent cars from gaining much speed, signal to them that they should be watching out for everyone, and generally discourage them from using the streets in question. It’s not like there’s a crush of traffic waiting to hit the roads at 4 p.m. on a Sunday afternoon. I noticed the exact same problem with a ciclovia ended across the country. Event ended at 4:00. At 4:01, it was incredibly uncomfortable to bike. They need to design a better “closing” segment. From where I was between Normandie and Western at about 3:45, it wasn’t just that they were clearing the street early, they were in echelon and driving at the crowd of people on the street saying “get on the sidewalk.” Even weirder, while they were clearly indicating that all of us needed to get off the street because it didn’t belong to us anymore, when they got closer, they started pointing at families with the sidewalk direction, but then pointed at me and said “you’re ok.” So basically they type-casted saying that parents towing a kiddie trailer needed to get off the street, but a young male on a road bike was ok for the big bad street. Really unfortunate messaging about who is and who isn’t welcome on our streets outside of special events. That’s so crazy… I didn’t see that where I was. But I’m guessing that they saw me in a dress (nevermind my road bike and clip shoes) and decided I wasn’t fit for the road, either — hence the “young lady” tsk tsking. I do believe that they were well-intended and were trying to avoid mass carnage. But it came across as very punitive. And, as I said, the terrible advice they were offering that was supposed to keep people safe was really troubling… I’ve ridden several CicLAvias to the bitter end for the very purpose of seeing how the turnover happens. This one was definitely the most aggressively in the “get out of the street!” camp and probably the worst place for novice riders to find themselves suddenly amongst vehicular traffic. I think the ideas about tapering some have mentioned below are not bad — maybe just keeping one lane each way cordoned off for bikes in busy sections could allow businesses to reap the benefits of the event and people to get home safely. Did you just say a massive CicLAvia breakout ride, like a new year’s dragon on wheels, across hill and dale? Or is that just what I heard? I noticed the change in traffic leaving about 2:30, travelling south on Hope. I’m not usually bothered by riding in traffic, but he people I was with were sufficiently freaked out that we ended up on the sidewalk walking. I had a similar thought to use the event to educate people on how cyclists can use the roads. Even a pamphlet of bullet points would be enough. Perhaps CicLAvia organizers need to open a more direct line of communication with LAPD brass in advance of the events and stay in constant contact with the first-level supervisors on the day of the event. If/When CicLAvia staff observe the police giving incorrect instructions at the end of the event (e.g. encouraging cyclists to hug the curb when cars are trying to turn right, telling folks to ride on the sidewalk, etc. ), then they can inform the on-scene LAPD supervisors to direct their officers to provide instructions in line with the CVC and best practices, rather than panicking and confusing the remaining riders. 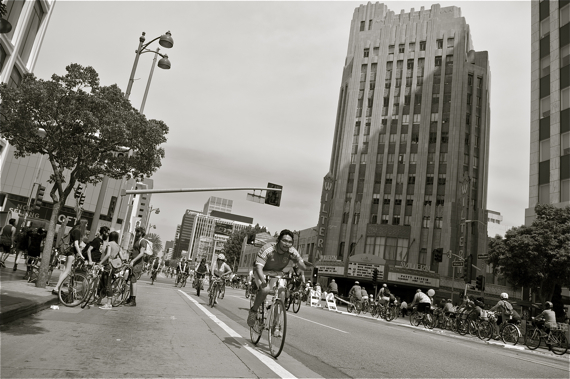 at the close of a previous ciclavia, once the streets opened, police were ordering cyclists to “get on the sidewalks,” which is illegal in some parts of the city, and not at all in-line with accepting bikes as vehicles that share the road. i don’t understand why road rules for cyclists are something even police patrolling a city-wide cycling event don’t understand or enforce correctly. i’d like to add, though, it’s not ciclavia’s job to educate the city traffic police on their own laws. all of these solutions for integrating the end of ciclavia back to regular traffic for the safety of the less experienced are great ideas, but the police should all be enforcing and protecting the same road rules. Another side effect of CicLAvia is extreme traffic on neighboring streets. I returned from Downtown on 7th Street instead of Wilshire to find this carnage. Piled up cars taking up the bike lane who were extremely displeased about the traffic the event caused. With no bike lane and angry drivers, I quickly cut back to the soon to be closed Wilshire route. those neighboring streets have “extreme traffic” every rush-hour, without any help from CicLAvia!